The SilverValley of Northern Idaho is one of the most beautiful places I’ve seen in America. Where the Coeur d’Alene river runs through the mountains of the same name, the valley links a chain of small lakes, until the river flows into the large, meandering Lake Coeur d’Alene. By the mouth of that river is the Old West steamer port town of Harrison, where I stayed in a creaky bed and breakfast, swam in the lake, and bathed in a claw foot tub. On the other end of the valley are the nineteenth century mining towns of Wallace and Cataldo, the latter being the home of the first Jesuit mission in the state. 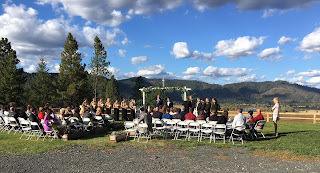 And somewhere in between was the ranch where my clients had their wedding. A relatively new gravel road was carved up the hill to a wedge of dirt and rock excavated from the mountain, big enough for the guests to park, and with a half barn sort of structure built to accommodate a reception, complete with ee-lec-tricity. It goes without saying that the hillside was an excellent place for the groomsmen to take some target practice before the festivities. And there was even a patch of grass for a ceremony. The whole place was equipped with a view built specially by God Himself, and a piece of it was conveniently framed by a white arbor with a cross on top, and a bough of fresh flowers. It’s a place to which I should return with my easel and paints. But on this occasion, I was contracted to draw caricatures, rather than a live oil painting. I always tell the women that my caricatures aren’t demeaning, that I’ll make them all look like movie stars. The men, however, have no such promise—especially if they’re the goofy type who invite a little satire. Certain precocious children sometimes tend to get drawn repeatedly, on the knees of all their favorite relatives. That’s not a problem in a group of just a hundred and fifty. I drove a long way, and I wasn’t about to leave until everyone who wanted a drawing got one. Or six.